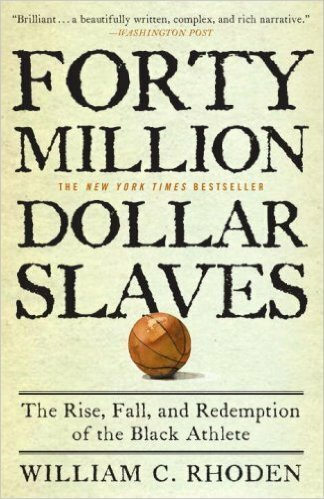 Provocative and controversial, Rhoden’s $40 Million Slaves weaves a compelling narrative of black athletes in the United States, from the plantation to their beginnings in nineteenth-century boxing rings to the history-making accomplishments of notable figures such as Jesse Owens, Althea Gibson, and Willie Mays. Rhoden reveals that black athletes’ “evolution” has merely been a journey from literal plantations—where sports were introduced as diversions to quell revolutionary stirrings—to today’s figurative ones, in the form of collegiate and professional sports programs. He details the “conveyor belt” that brings kids from inner cities and small towns to big-time programs, where they’re cut off from their roots and exploited by team owners, sports agents, and the media. He also sets his sights on athletes like Michael Jordan, who he says have abdicated their responsibility to the community with an apathy that borders on treason.